Skin exfoliation is the partial removal of the upper layer of dead skin cells on the dermis. This can be done in a variety of ways and is particularly beneficial for people who suffer with ingrown hairs after hair removal. This is because a layer of dead skin cells can interfere with the newly emerging hair by clogging the hair follicle and causing it to ingrow. Additionally regular exfoliation brings any pre existing ingrown hairs to the surface and allows them to pop out. Types of exfoliation are divided into two main areas, chemical and physical. listed bellow are some of the most popular. The traditional Loofah is probably one of the most recognizable methods of exfoliation. This is used when showering or bathing and used in conjunction with soap and water. A rough stone that when rubbed against skin remove dead or compacted skin. More often used on calluses and hard skin on the feet. Often used in expensive jars of exfoliating products together with fragrance and moisturizers, sugar and oil is another traditional and easily made at home exfoliant. The sugar does not dissolve or go too sticky when suspended in oil. It does however exfoliate skin when rubbed into the skin prior to bathing or showering. Using a light oil is obviously preferable or alternatively one which you would use to moisturize your skin. Exfoliating creams are usually made from a moisturizing cream which has finely ground nut shells particles incorporated. The nut shells are the thing that does the exfoliating and works in a similar way to the sugar and oil. Used before showering. If you are suffering with painful, inflamed ingrown hair after hair removal then the thought of rubbing in an exfoliant or scrubbing with a Loofah may not appeal that much!! Thankfully Aloeclear offers a pain free alternative. 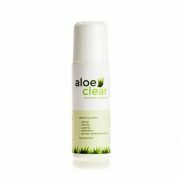 Aloeclear contains Salicylic acid and Glycolic acid, both commonly used ingredients in cosmetic products and acne creams. Salicylic acid and Glycolic acid are both powerful exfoliants and with regular use will bring clear, fresh and healthy new skin to the surface. powerful moisturizers also act to soften, Mentha Pepperita cools and soothes. So in short with regular use Aloeclear will remove the need for manual exfoliation, particularly in tender areas line the neck, under arms and bikini line. Plus the best news of all is that Salicylic acid and Glycolic acid are both proven to have an anti aging effect on the skin, the latter often being used in extremely expensive skin care brands. Aloeclear comes it 2 trial sizes, one for men and one for women. Called Bikini Saver and Shave Saver they are priced at just£2.95 and offer a weeks protection.